My son lives in Hawaii, so being dedicated and dutiful parents that we are, my husband Scot and I try to visit Oahu on a fairly regular basis. 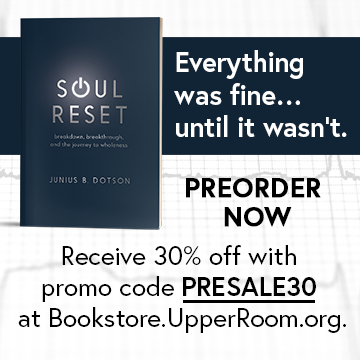 A few months ago I discovered that at Discipleship Ministries we have a new board member, Rev. Piula Ala’ilima, who also lives on the Hawaiian island of Oahu. I had the pleasure of meeting Piula this past March at our Spring board meeting in Nashville. I felt an immediate connection to Piula, not only because he lives on the same island as my son, but also because we have a mutual dear friend. We just hit it off. I told Piula that we had tickets to visit Hawaii in May, and that when we were there, I would bring my family to visit his church. We made plans, and on Mother’s Day I attended Wesley United Methodist Church with my family. It was a wonderful service, at which the mothers were given flowers, guests were presented with leis, and my family was warmly welcomed by our new friend Piula, his lovely wife, Kim, their beautiful daughters, and the entire congregation. After the service Piula invited my family to share a lunch with him midweek. We agreed and planned to meet at a local fish restaurant, where we enjoyed delicious food and engaging conversation. During our lunch Piula mentioned to me that he had, on occasion, presided at the sacrament of Holy Communion using coconut in place of the more common elements of bread and wine. Now before I go on, let me stop and explain that Piula is not a native Hawaiian. Rather, he hails from the Polynesian Island of Samoa. He explained that in Samoa, coconuts occupy a near-sacred position of importance to the people who live on the island. Piula extolled the virtues of the coconut to my family over lunch. He spoke about its many uses: for food, for fuel, for making rope, for storing things. I can’t remember everything he said, but it was clear that coconuts occupied a place of great importance in the culture of Samoa and in Piula’s life personally. He shared that during World War II, when blood was in short supply, injured soldiers had sometimes received coconut water intravenously, because if taken directly from the coconut, the substance is not only sterile, but has an ideal composition ratio of sugar, sodium, potassium, and other electrolytes, making it similar to human blood. Because bread and the juice of grapes are not food sources native to places like Samoa and Hawaii, and because of the sacred nature of the coconut to the people of Samoa in particular, as well as its ability to substitute for human blood, it came as no surprise to me that when Christianity was introduced to Samoa, the people would have understood the coconut to be the most natural element to use in the ritual of Holy Communion: coconut meat in place of bread, and the water in place of grape juice or wine. 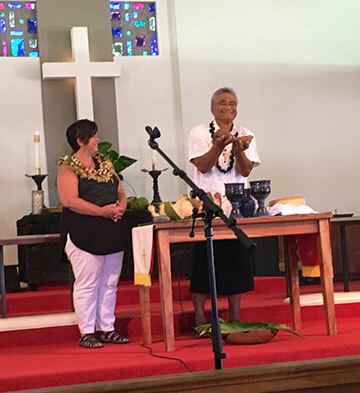 Communion using coconut is also celebrated on occasion by Wesleyan Methodists in the Kingdom of Tonga, also part of Polynesia. 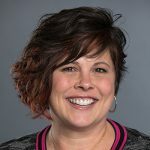 Now, I need to say that as a scholar of sacramental practice in the United Methodist Church, ordinarily I would not recommend that Holy Communion be celebrated with any substance other than what is called for in our worship standards. According to This Holy Mystery, the official United Methodist teaching document on our standards and practice, in accordance with Christ and the Christian tradition the church uses bread and wine (or grape juice) in our celebration of the holy meal. (See pages 29-30, under the section “The Communion Elements.) The document makes it clear that the bread should be a plain loaf, free of frosting, nuts, raisins, artificial coloring or other additions. It can be leavened or unleavened. The cup should contain wine or unfermented grape juice. This is the standard. However, the authors note that worship planners should be sensitive to local situations, using bread made from other grains that are more readily available when necessary, and juice from a fruit other than the grape if wine or grape juice is unavailable or cost prohibitive. We often get questions at Discipleship Ministries about whether it is appropriate to substitute other elements deemed appropriate for the context. For example, goldfish crackers and apple juice for Vacation Bible School, or donuts and cola for the youth group. The answer is normally no. If the traditional elements—a loaf of plain bread and juice from the grape—are available, that’s what should be used. On the island of Hawaii, while bread and grape juice may be quite expensive (as everything is in Hawaii) these elements are readily available. So when Piula told me about using coconut meat and water for communion at his church, I was naturally very curious to learn more about this practice. Since we were going to be in town for another week, including a Sunday, I asked him if they were planning on celebrating Holy Communion at Wesley the upcoming Sunday. He said they were. I then asked if they would be using the coconut. He said that this was not their normal practice, and he had not planned to, but if I wanted to experience it he might be able to arrange it. Of course I said I did want to experience it, and I am grateful that he was willing to accommodate my request. As the day approached, I received a note from Piula graciously inviting me to join him in presiding at the table. I was honored to receive this invitation, and excited to get to watch the action up close. For the occasion he presented me with a beautiful hand-woven lei to wear as I co-presided with him. 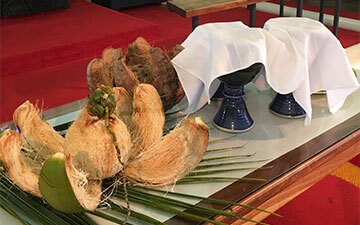 The table was set with both bread (baked by a member of the congregation) and grape juice, and a coconut. Piula led the congregation through an extemporaneous version of The Great Thanksgiving, praying in the Triune pattern, and giving thanks for God in creation, God in Christ, and God in the Holy Spirit present in our world. As part of the prayer he spoke of the importance of the coconut, giving thanks for its life-giving properties and its sacred nature in his native island of Samoa. He affirmed the coconut as a natural symbol for communion, emphasizing the “common-union” inherent in the fruit: whereas the bread and wine are separate entities, the coconut contains both the meat (bread) and water (wine). 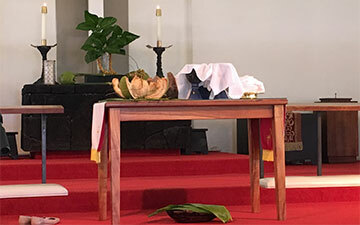 In the unity of the coconut, Reverend Ala’ilima prayed, the meat and water are one, as the body and blood of Christ are one, and as we are made one in the Holy Spirit. When the time came to break the bread and bless the cup, Piula invited me to pray over the grape juice. After the bread and cup were blessed we turned our attention to preparing the coconut. Being from Samoa, Piula was an expert at handling the fruit. First, he broke it with a single blow from a smooth rock. As he pulled it apart the water poured into a wide vessel carved out of native wood. Using his hands, Piula began to peel off the husk and remove the meat, breaking it apart into small pieces with his fingers. Watching him prepare the table in this way was a true joy because it seemed so very natural to who he is as a person and as a pastoral leader. When we had finished taking, blessing, and breaking the bread and juice, and the coconut flesh and water, Piula invited the congregation to come and share in the holy meal in whatever way felt most comfortable for each member. He did not force everyone to partake of the coconut; rather, he offered it alongside the traditional elements, allowing individuals to choose what they received. Some received both bread and juice and coconut meat and water. Some dipped bread in coconut water, while others dipped coconut meat in grape juice. Some, including me, received only coconut meat and water. Being on Island time, we took all the time we needed to serve the congregation. It was a wonderful, joyous celebration of the holy meal. In my opinion, what made the coconut an appropriate substitution for the normal elements of bread and grape juice was the unique situation of authentic pastoral leadership from Piula, combined with an appropriate context for this substitution to take place. Would I ordinarily encourage people to give this a try in their own congregation? Absolutely not. And would this be appropriate at all churches in Hawaii? Again, my answer would be no, because most pastors in Hawaii are not Samoan or Tongan. But in this particular situation—with this servant of the Lord in a congregation he has been with for many years, and on an Island in the Pacific—my response was an enthusiastic yes! I give thanks to God for the authentic, appropriate and sensitively rendered inculturation of Holy Communion by Rev. Piula Ala’ilima and the congregation of Wesley United Methodist Church in Honolulu for the gift of Coconut Communion. Thanks be to God!